We met Zakayo Nderi on Nick’s roof one humid afternoon. He said very little. Seemed incredibly shy, slightly bewildered. Small wonder. It was his first trip outside Kenya. He wasn’t used to the heat in Singapore. Wasn’t used to the food. Had never cycled on a road with no potholes. If he felt it all a little surreal, so did we. His story – Nick’s story – isn’t something you’d expect to find in Singapore. Photographer wants to turn Kenyan shoeshine boy into the next Marco Pantani. 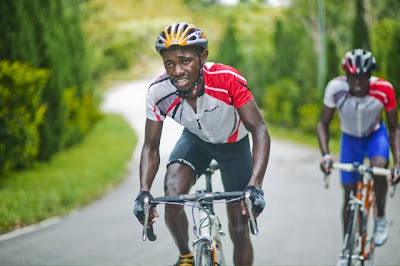 Zakayo Nderi wants to be the first black man to cycle in the Tour de France. The first this. The next that. Oh, the audacity. But the months that followed made us firm converts. “My heart sings when I watch him ride,” Nick yelled over the din of passing cars in Genting last year. We were there to test Zakayo’s legs. See how fast he could go up Genting – reputedly the world’s fifth toughest climb. He beat a top Malaysian rider by a good ten minutes during that trip, clocked even more phenomenal times on subsequent attempts. But not many people noticed or cared. Maybe it just sounded a little too loopy. And then we went to Alpe d’Huez. 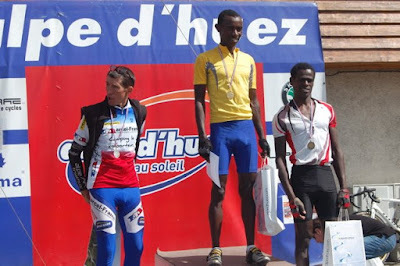 And Zakayo clocked the fastest time up the mountain (outside the Tour de France) this year. His teammate, Samwel Mwangi, also made the top five. They won prizes. The press showed up. The Mayor took interest. Nick’s phone hasn’t stopped ringing since. Loads of people now want in on the loopiness. Because loopy is good. Loopy makes things happen. And Zakayo? He’s all quiet confidence now. Still a man of few words. “I’m training and waiting for the next step,” he said just before we left France. So are we. With bated breath.